Moss Building and Design releases their new Enhanced Referral Program. Refer three friends and receive a free handyman for a day! Simple as that, no strings attached. 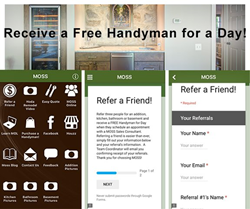 Moss Building & Design is announcing their new Enhanced Referral Program to Northern Virginia homeowners. In the past, a successful referral to MOSS, (successful meaning resulting in doing business with MOSS) earned the 'referee' a Free Handyman for a Day. With their new referral program, referrals simply need to attend an appointment with a sales consultant. If the 'referee' refers three people who attend an appointment with a MOSS Sales Consultant for an addition, kitchen, bathroom or basement remodel, he or she will immediately receive a free handyman for a day. Simple as that, no strings attached. Northern Virginia homeowners can finally get everything checked off of their ‘honey-do’ list, and just in time for the holiday season. Recommending Moss Building & Design to friends who are considering remodeling their addition, kitchen, bathroom or basement will be beneficial for both parties involved. Simply call MOSS at 703-961-7707 or e-mail their Team Coordinators at Sales@MossBuildingandDesign.com. When the person referred schedules an appointment, MOSS will automatically keep track of the referrals. There is also a way to submit referrals through the MOSS app, here. Call, e-mail, or log-in to the app periodically, because there is no expiration date on the offer.